When I started writing this blog in Nov. 2005, I set a goal that I would write 100,000 words within 3 years and stick with it. It was not easy, but I finally accomplished my goal this month four months earlier than I expected. I wanted not only to improve my English skills but for people all over the world to see my albums and travel notes. If I could become friends with many people on the globe and visit them after my retirement it would be my great pleasure. Don't hesitate to send an e-mail to me! An incident occurred in my house, involuntarily shouting "What?". 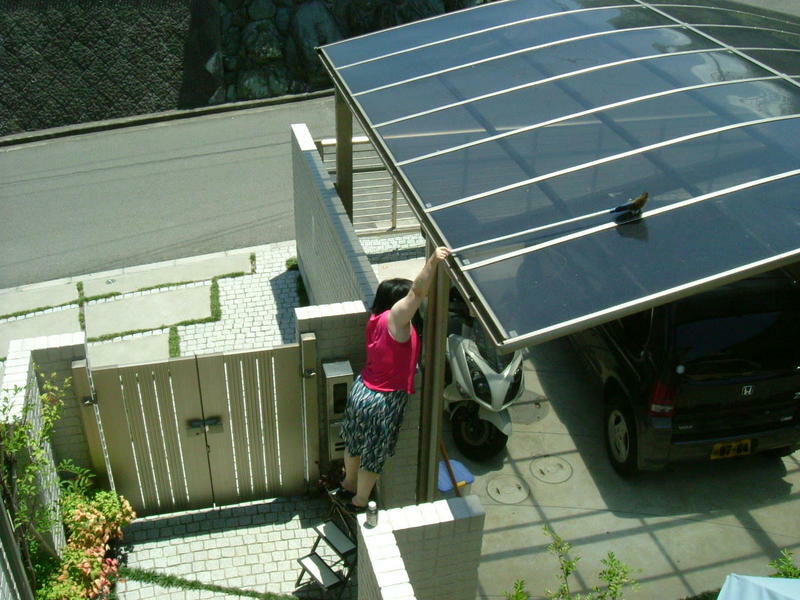 I'm showing a picture of the roof of my garage. Something was on the roof! 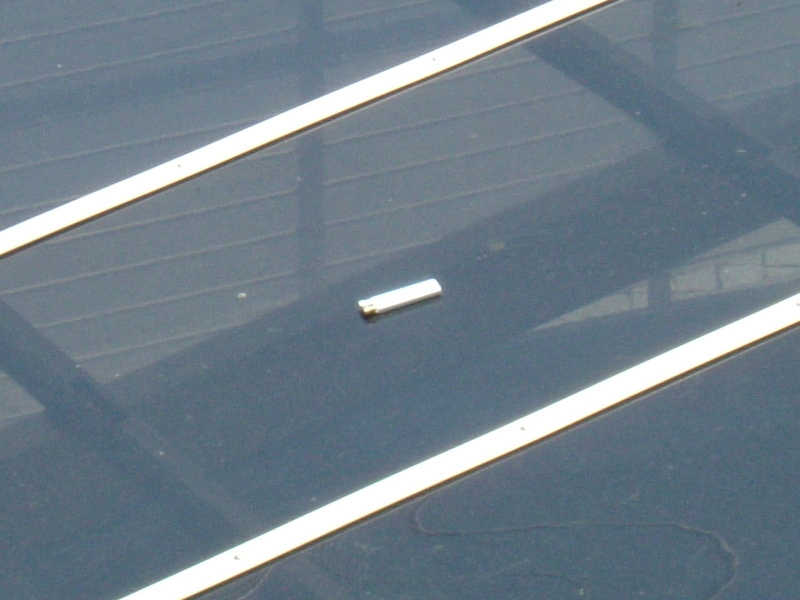 On closer sight it was a disposable lighter. Why? Someone had acted up? I couldn't find the exact answer, but it was possibly done by a bird. It was kind of fun, but it was so extremely hot that the lighter might have caught on fire. I decided to remove it immediately, but I didn't have a stepladder. When I was about to go out to buy one, my wife stopped me saying "You can use the broom and the rack for the plant pots and the planters. She didn't want to spend any money and I insisted that we absolutely needed a big stepladder. 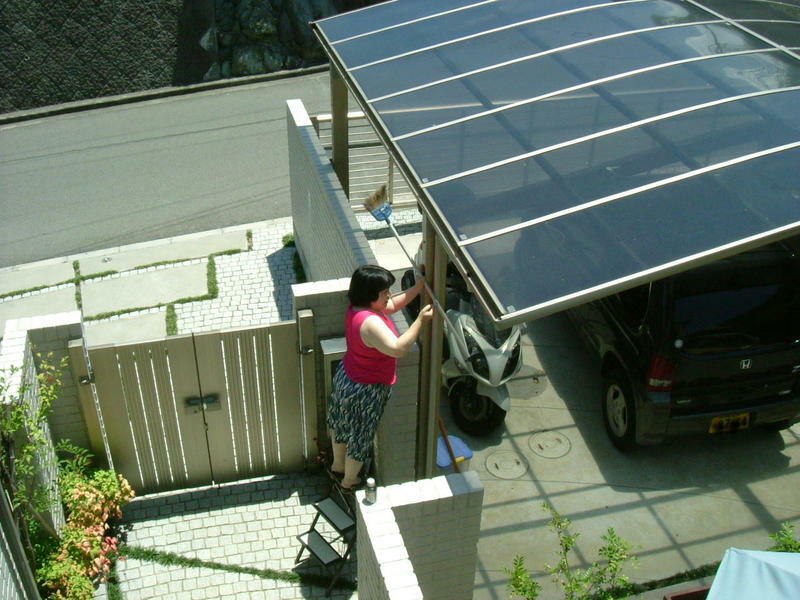 We had a small quarrel and finally my wife said, "I'll try" and she did it! July 26th is an unfogettable day for the citizens of Matsuyama City. On this day of 1945, Matsuyama was heavily bombed several times and hundreds of people were killed. The accurate number of victims is still unknown. Why were the citizens killed this way? They neither had nor made any weapons. They were just citizens, not military personnel. The U.S. Government has never apologized for the bombing. They have justified their military actions over 60 years. However, how can they possibly justfy their actions? The Japanese have been educated by U.S. methods. The Japanese did bad things during the last war and were punished. The U.S., 'the generous country,' helped Japan rebuild from the devastation. These are their excuses. The Japanese have been brainwashed since 1945. I think it's time to examine what made Japan move to such a reckless war. I'd like to insist that the most sinful war criminals are Franklin Delano Roosevelt and Harry Shippe Truman. When I wrote about irori, the Japanese traditional hearth in the previous entry, I didn't have a picture of the irori and looked for it on the internet. Finally, I found one on the net. I liked it and I sent an e-mail to the owner of the website to ask permission to use his picture in my blog. Two days later the reply saying ok arrived. I was surprised to see his signature. He was Japanese, but his address was in Chilliwack BC in Canada. There are many countries on the earth. Nevertheless, there's a high possibility that my foreign acquaintances have something to do with Vancouver or BC in Canada. The person who advised me to write this blog for brushing up my English skills was a Japanese pilot who was living in Vancouver. It was in Victoria that Mr. Inazo Nitobe passed away, whose writings had inspired me to travel all over the world when I was a university student. I'm thinking about my next vacation plan in Canada. My wife and I are interested in a houseboat. I'd like to stay on a lake without doing anything special, just enjoying the time passing. The present first choice is Okanagan Lake, because it is narrow and long. If it was a round lake I wonder if I could easily lose the way. Anyway, my life is getting happier. I'm writing about the material of my chopsticks that I got the other day and wrote about in the last entry. The material of my portable chopsticks is "susudake" in Japanese. I imagine that most subscribers don't know "susudake". Though I looked "susudake" up in my Japanese-English dictionary and on the internet, I couldn't find an exact translation in English. I'll explain "susudake" in the next paragraph. At first, take a look at the picture at the bottom. 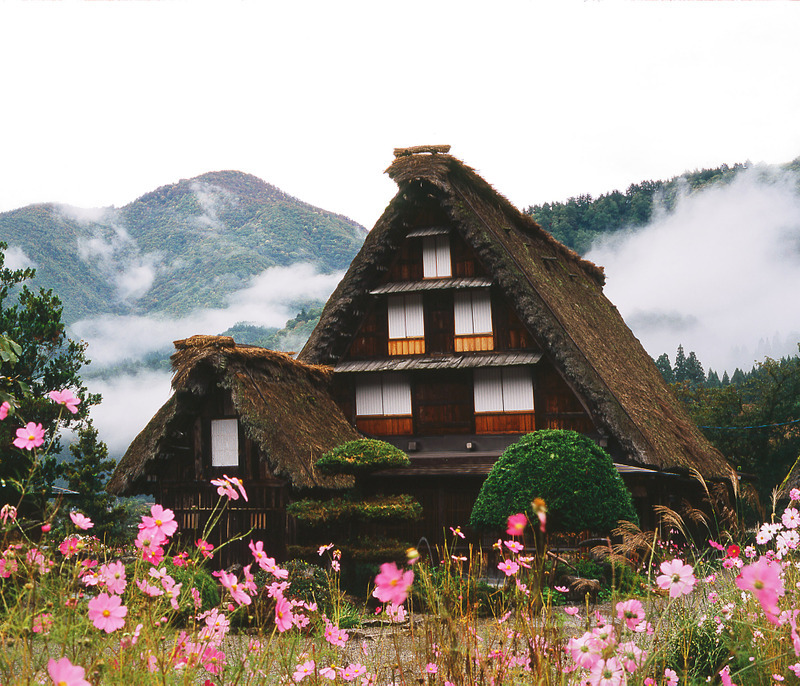 This is a Japanese traditional house topped by a thatched roof. 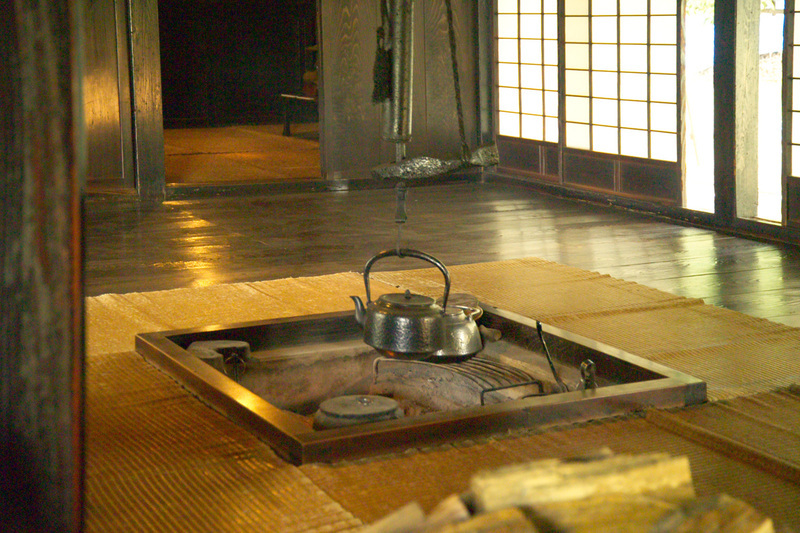 In this type of house, there is an "irori", the traditional hearth, usually in the biggest room. I'm also showing the irori below. 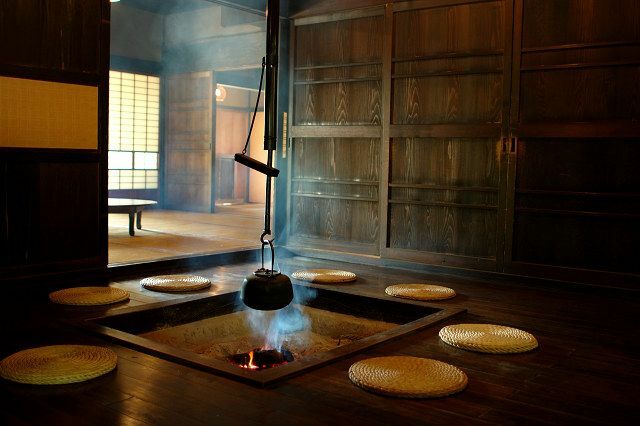 Irori is the sunken space for the fire and is designed to be in the center of the room. This space is used for cooking and heating the house. Pots and kettles are hung by the pot hook, or jizaikagi, over the irori. These hooks are generally hollow bamboo tubes with an iron rod penetrating the middle. The attached lever, which is often shaped like a fish, allows the pot or kettle to be raised or lowered. Bamboo is also used for the ceiling of the irori room. These hollow bamboos are called "susudake," which means bamboo with grime. It takes 100-150 years for susudake to be made and it can be produced only when the old houses are torn down. This material is very valuable. That's the reason for the high price. My chopsticks are handy and worth the price. It might be seen as curious for western people, but many Japanese use their own chopsticks at home. 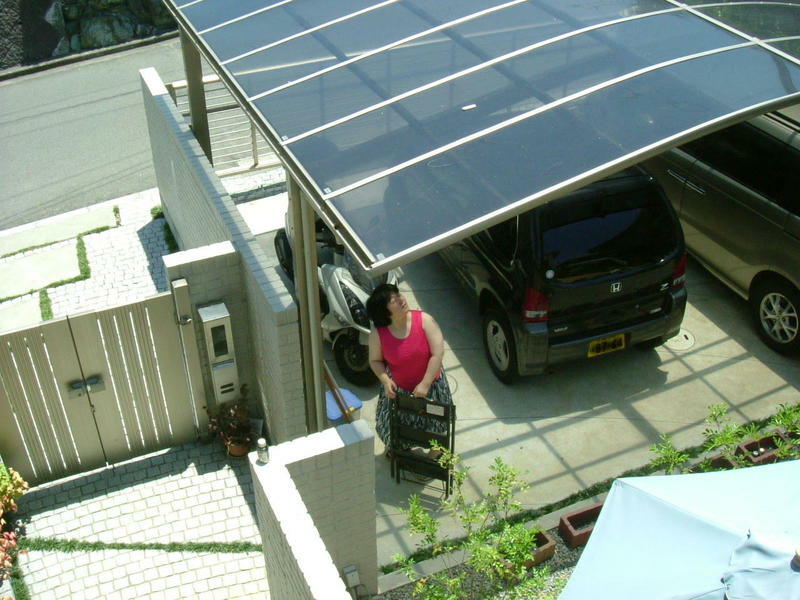 On the other hand, they use disposable ones outside like in restaurants and on hiking trips. 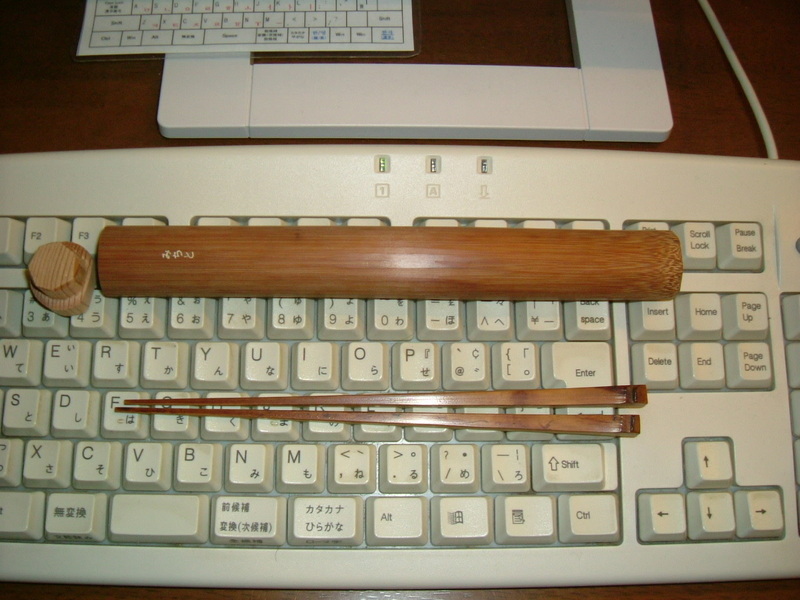 Disposable chopsticks are made of thinned wood, which was cut down to manage the forest. Tree thinning is necessary to keep the forest healthy. Thinned wood is a kind of waste material and I thought it was not bad for greenhouse gas emission because the wood was grown by absorbing CO2 gas. Throwing away the disposable chopsticks only means expiring CO2 gas that was absorbed during growth. However, thinned wood is extremely versatile and it's a waste to use it as chopsticks. Additionally, Chinese-made chopsticks have the concern that some poisonous chemicals might have been used in the process of bleaching, coloring and sterilization. I decided to stop using disposable chopsticks and carry my own chopsticks. It is one of my small actions against global warming. That said, I didn't have to get chopsticks urgently, so I have dropped in at chopstick shops sometimes over these three months. Then, today, I found nice chopsticks in a special fair in a department store. A famous craftsman, who came from Kyoto, a noted historic city, was advertising and selling his products. I listened to his lesson about chopsticks and realized how little knowledge I had about chopsticks that I had used almost every day since I was in short pants. During his lesson, I tried to pick some food up with various chopsticks. A small piece of konjac (http://en.wikipedia.org/wiki/Konjac), Udon (http://en.wikipedia.org/wiki/Udon), a julienne carrot, a small fishbone, , , these were hard to pick up with ordinary chopsticks. The craftsman said, "If you carry your own chopsticks all the time, the chopsticks must be multipurpose. 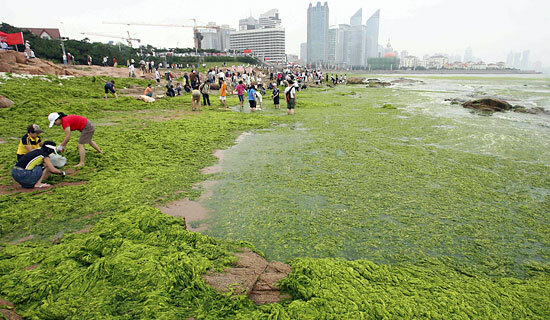 If you use disposable ones when you eat Udon at a restaurant, it would be nonsense to take along your own chopsticks." For subscribers who have not eaten Udon with chopsticks, disposable ones are more useful to pick up and cut the noodle rather than ordinary lacquered chopsticks. The craftsman wanted to emphasize that I shouldn't use disposable ones even when I eat Udon. Finally I bought one of his suggestions that cost 12000 yen, about 120 U.S.$.! Can you believe the price? I'm explaining the material of the chopsticks in the next entry. Yuri is my second daughter and 20 years old. She is a college student in Nagoya city, one of the biggest cities in Japan. She is learning German culture. A picture arrived today from her. A cell phone with a digital camera is really useful. Yuri is a girl with a green skirt at the furthest right in the picture. 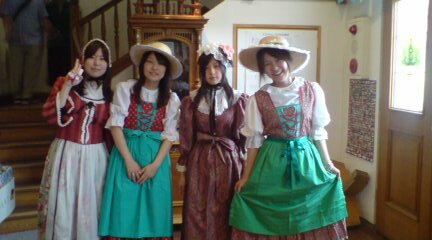 She was visiting a folk museum with her classmates. I was relieved to see her smile. I watched the movie "August Rush" on the flight to Japan in March. Robin Williams starred in the movie and he is one of my favorite actors. He is always the protagonist, but he wasn't in this movie. Anyway, I have wanted to catch it again. I found the ad poster on the street today. This movie had already been released in my city in June, but I didn't notice it because of an inappropriate translation. "August Rush" is the name of the hero, so the title in Japanese should be オーガスト・ラッシュ (August Rush) without changing it. For your information, the Japanese title is "A miraculous symphony." A will leave for Hokkaido for the school trip next week. I hope she will have a good memory of it with her friends, but I have a concern. As you know, the G8 Hokkaido Toyako Summit will be held in Hokkaido at the same time. The Japanese Government will have elaborate plans against terrorist plots, but I'm afraid A could be involved in the terror. A group of parents were insisting that the trip be put-off for security reasons and to avoid the packed airport and jammed traffic. Their opinion is acceptable, at least for me. However, that wasn't the case in the eyes of A. She said they should visit there just now, because it is a rare chance to see what the summit meeting is like. Her way of thinking is just like me. Opportunities are not always in our reach. Her life will be active and aggressive in a good way. I often feel that I'm lucky to have learned English. While watching American movies, I really get the feeling. I caught the movie "Bucket List" starring Morgan Freeman and Jack Nicholson. I think both are great, talented and are the people who were born to become actors. By the way, the original title is translated into Japanese with a different title. The Japanese title is 「最高の人生の見つけ方」. If retranslated into English the title would be "How to find the best way of life". Japanese and English are completely different languages and such a translation of the title might be inevitable. When Morgan wrote "Bucket List" on the memo pad, "棺桶リスト" which means "coffin list" in English, appeared on the Japanese subtitles. I wondered why bucket had the meaning of coffin or the translater might have made an association of ideas from bucket to basket and next casket. As soon as Jack found the note, he shouted "kick the bucket" blah, blah, blah. I dare to expound my opinion here to get the criticism of native speakers. There's a phrase "kick the bucket" that means "die". To tell the truth, I had an image about "kick the bucket" in which a man trips over a bucket and fall down and finally hits his head and dies. I investigated the real meaning of this phrase in the big etymological dictionary and found the origin of the phrase. The bucket indicates the stepstool of the hanging platform. If you kick this stepstool, you would be hung up from the tree or something. If so, "kick the bucket" would mean only suicide, but this phrase looks like it's used in any type of death, like death from illnesses, accidents, or even murders. It's funny, but coming back to the right track, let's think about the kicking. Just after kicking the bucket, the man will die. That is to say, kicking the bucket is the last intentional action in his life. This is my conclusion. Can I express things that we want to do at the end of our life as the buckets? "To kick the bucket" does indeed mean to die in a general sense, but it comes from rhyming cockney slang.